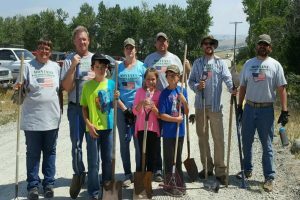 On August 6th, Chris Grudzinski, John Arnold, Sam Bruner, Mike Kuntz and Elizabeth Regland went to Drummond for a field clean-up day to meet the land owners for permission to hunt for elk during the shoulder season. We all brought shovels and rakes to help clean up dead fall before the season open for a special tag cow elk. It was a hot day that had us all sweating but earned the permission from the land owners to hunt the shoulder season. 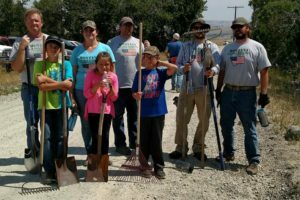 On September 23-25, the ranch called on short notice to offer the weekend for the elk hunt to the Montana Wounded Warriors who came for the clean-up day. The only warriors able to come on short notice were John Arnold and Sam Bruner. They camped in the field on the ranch and picked out a perfect spot to watch for the elk traveling from one property to the next. The window of opportunity for elk to come their way was a small one and had to be taken when presented. 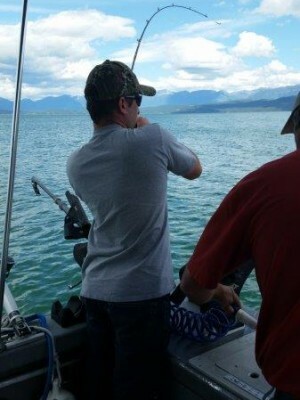 Sam had never shot an elk before so John was going to give him the first go at it. 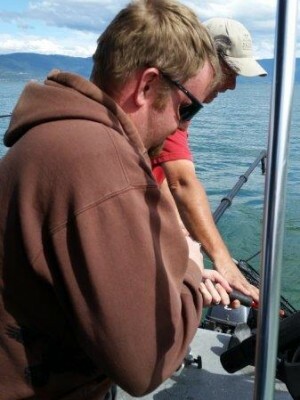 Being this was a cow only shoulder season, Sam was eager to get the chance at an elk. 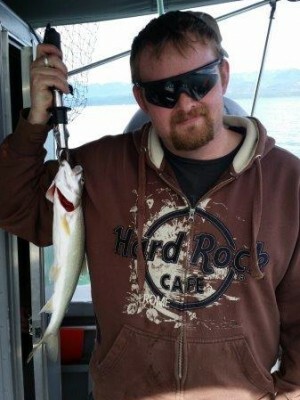 When the elk presented themselves, Sam took the shot and hit his elk. 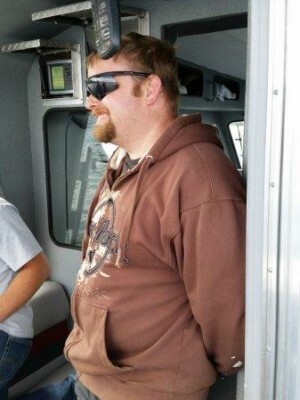 John had a very difficult window to shoot his cow but he kept focus on Sam’s elk to assure they could find her. They found Sam’s first cow elk and he could not have been happier. 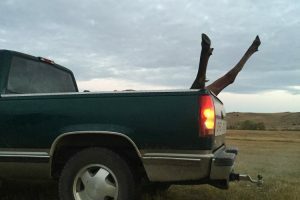 They radioed the ranch owners and they came and loaded up the elk into Sam’s truck. How’s that for service! 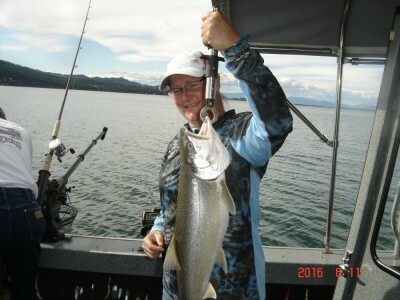 Due to the heat of it being September and the chance of the elk spoiling, Sam headed home immediately to avoid the elk meat spoiling. The only picture that was taken was of Sam’s truck leaving for home with the legs sticking up. 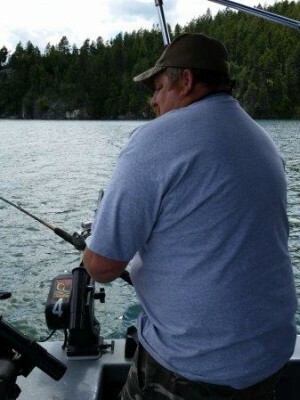 John stayed and didn’t get another chance at an elk before it was time to go. It was a fast but exciting trip and opportunity to be able to hunt this early in the season and it extends till January 15 of 2017. 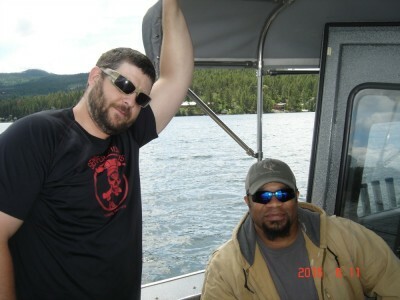 More camaraderie has been building as two Montana wounded vets decided to climb Red Mountain. 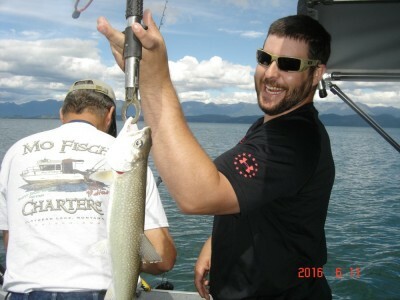 The trip consisted of Chris Grudzinski and his wife Kristin and John Arnold and his girlfriend Hallie. They stayed in the beautiful Homestake Lodge near Whitehall and had the opportunity to walk around and explore the 200 plus acres of trails and amazing wildlife. The ascent up Red Mountain began roughly at 7000 feet (where they parked), and the two couples hiked up to the summit at 10,345 feet. It was a very challenging and physically demanding hike, but in every sense of the word worth it. This was such a empowering, positive boost to all of them. 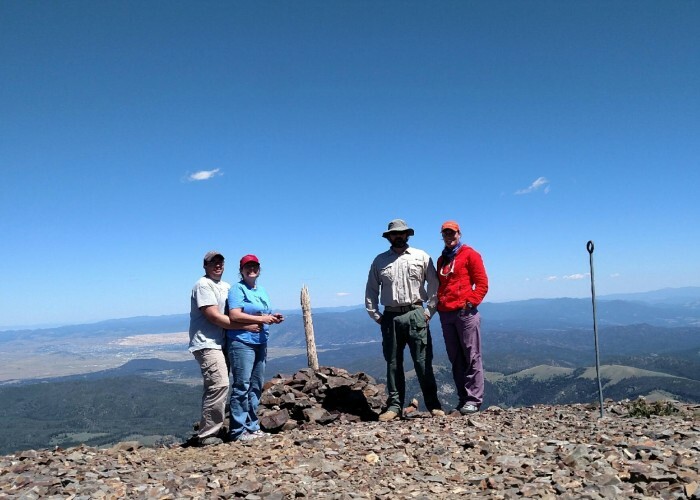 It took them just over three hours to reach the summit, but it was time worth spent and they enjoyed the summit like nothing ever seen before. The 360 view was amazing and the pain it took to get up there was shared by all of the as they helped and pushed each other the entire way. 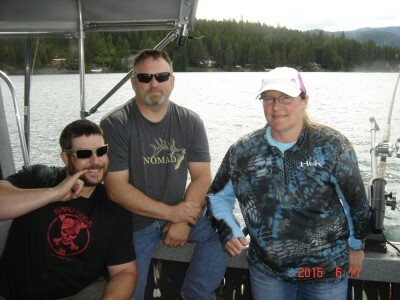 After the hike they returned to the Homestake Lodge and enjoyed awesome food, company and the view of watching 2 bull moose just off the deck playing in the trees and watering hole. 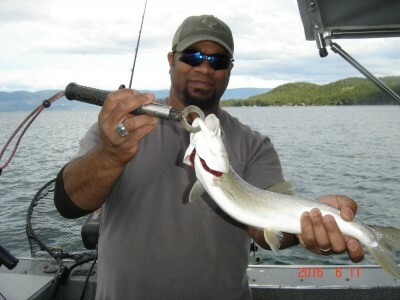 The company, accommodations, food, scenery, wildlife, exercise and conversation were great, and there are plans in the works to do this again with a much larger group of anxious warriors in the future. 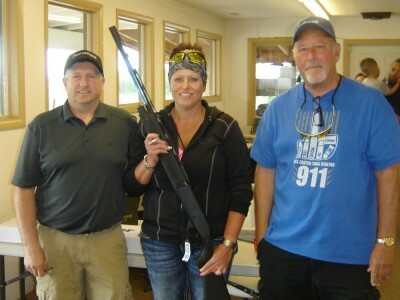 The second weekend in June we had another successful fundraising event at the Flathead Valley Clay Target Club in Kalispell. 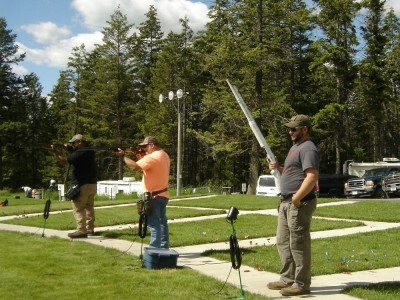 Friday night we had a cookout at the club and our vets got to practice their trap shooting. 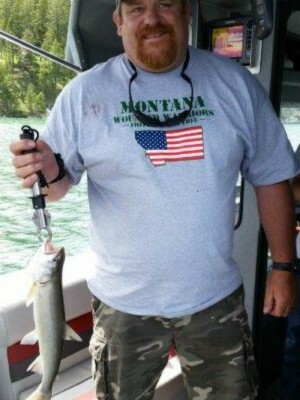 Saturday one of our vets, Billy Beck of Kalispell, won the new shooter event and a very nice belt buckle. 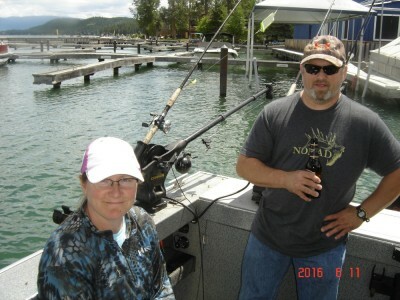 In the afternoon two local fishing charters, A Able and Mofisch, took our vets out on Flathead Lake. 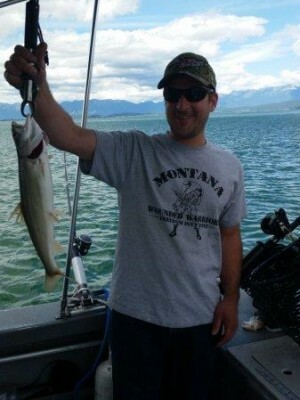 Sunday morning we had another winner in the new shooter event, as Charles Williams of Kalispell won a belt buckle. 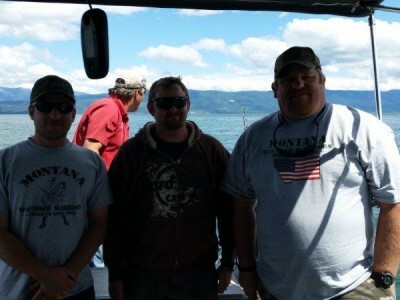 This is the sixth year the Clay Target Club has put on this fundraising event for Montana Wounded Warriors and we would just like to let Norm Nicholson and the rest of the board know how much we appreciate their continued support. 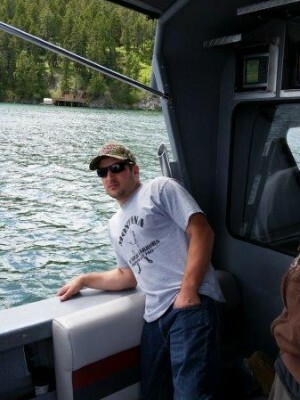 Montana Wounded Warriors was contacted in December by John Wells, a rancher of White Sulphur Springs. 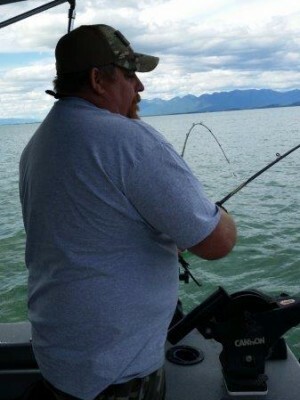 He was interested in reducing his herd of buffalo, and wondered if we’d be interested in purchasing theses animals at a discount to help fill the freezers of several of our wounded veterans. We saw this as a great opportunity to provide over a thousand pounds of nutritious meat for our veterans families, and have a little fun in the process. When all was said and done, five buffalo were on the ground and a great time was had by all. Those whose freezers were filled were Chuck Hayter, Spencer Keck, Adam Greenwell, Travis Norby, Sam Bruner, Clint Mainwaring, Jacob Parker and Chris Grudzinski. Thanks to John Wells and his staff for this great opportunity to bless our wounded vets!! THANKS AGAIN to all of you who have participated in the 2008 Harley Davidson XL 1200 Nightster raffle. Thank you to Jim Peterson of Valley Ford for allowing the motorcycle to be displayed in their show room where they sold tickets and provided a cook out on the day of the drawing. Thank you to Evergreen Army Navy with their help in selling tickets. We would also like to thank the Flathead Beacon for helping us get the word out about Denton Moberly’s donation and the raffle. And CONGRATULATIONS to Rob Schrider of Ronan, the lucky winner!!! Left to Right: Jesse Mann, president of MTWW, with young man who picked the winning ticket; Jim Peterson looking on as Dave Sheldon, board member of MTWW calls Rob Schrider to give him the good news; Rob picking up the bike from Jesse Mann. 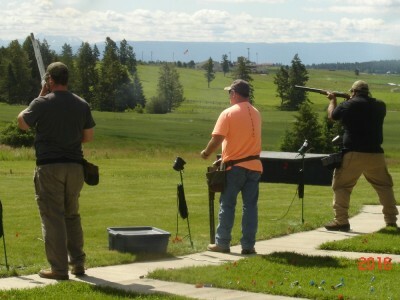 Flathead Valley Clay Target Club held their fifth annual fundraiser for Montana Wounded Warriors on June 12-14th. 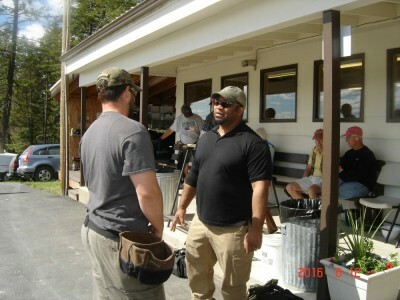 The weekend started on Friday night with a cookout and practice shooting for our wounded veterans. On Saturday, over 50 participants as well as local and out of town wounded veterans competed in single and double events. 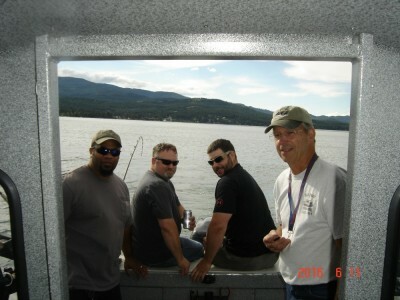 Then, on Saturday afternoon, we took our veterans out on Flathead Lake for some fishing. 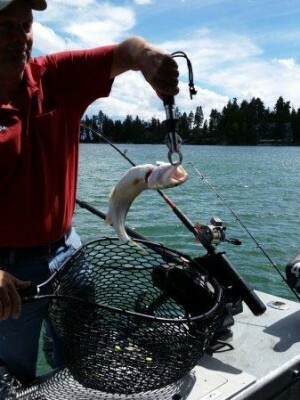 A Able Fishing from Bigfork took one boat out, and Mo Fisch Company from Lakeside took two boats out. What a beautiful day! 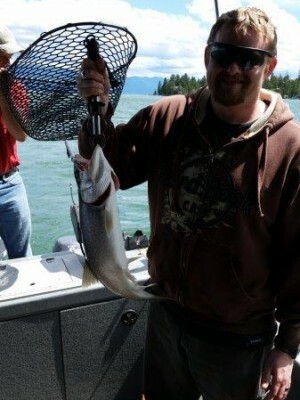 The fishing was incredible, with each boat landing 15 lakers. We ended the day at Spencer and Co. with a steak dinner for our veterans. Sunday ended the weekend with more shooting. 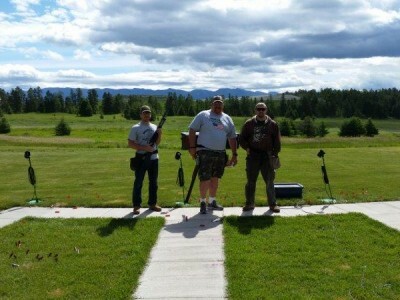 Montana Wounded Warriors would like to thank Flathead Valley Clay Target Club for their continued support and welcoming atmosphere for our wounded veterans. They raised $3500.00 for our veterans this year. 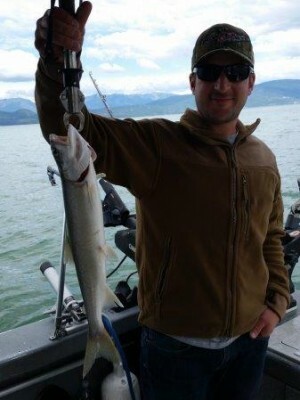 We’d also like to thank A Able and Mo Fisch Fishing Companies for the successful fishing trip on the lake. And again, a special thanks to the staff at Spencer and Co. for their great food and service. 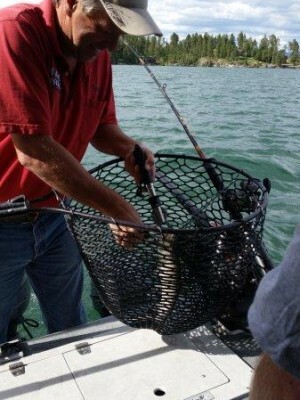 Our veterans are looking forward to this again next year. 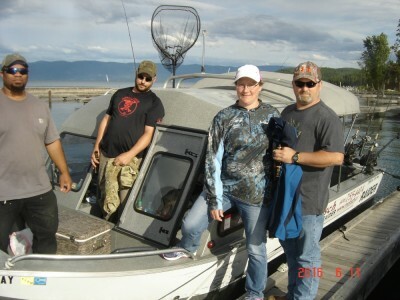 Steve Heger, of Kalispell, was the lucky winner of the Tika-T3, Sako 30.06 rifle raffled off by Montana Wounded Warriors. The rifle was donated by a couple from Columbia Falls who would like to remain anonymous, but we would like to thank them and let them know how much we appreciate their generosity. 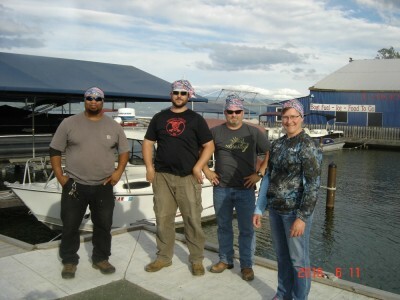 The drawing was held at the Flathead Valley Clay Target Club on Thursday, March 12th, during the winter league shoot. Congratulations to Steve and thank you to all of our supporters who purchased a ticket. Pictured above from left to right: Neil Baumann, board member MTWW, Steve Heger, raffle winner, and Dave Sheldon, board member MTWW.